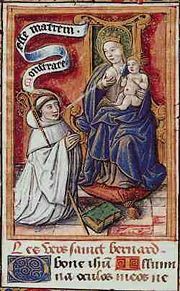 Saint Bernard of Clairvaux (1090 - August 21, 1153) was a French abbot and the primary builder of the reforming Cistercian monastic order. The dominant voice of Christian conscience in the second quarter of the twelfth century C.E., his authority was decisive in ending the papal schism of 1130. A conservative in theological matters, he forcefully opposed the early scholastic movement of the twelfth century, denouncing its great exponent, Peter Abelard, forcing him into retirement from his teaching position at the University of Paris, and later convicting him of heresy. In association with his former protegé, Pope Eugenius III, he was the primary preacher of the Second Crusade, a cause which failed to achieve the glories he expected of it. Devoted to the veneration of the Virgin Mary, Bernard is credited as being a major influence in promoting a personal relationship with a compassionate God through Mary's intercession. By all accounts he was a deeply spiritual, ascetic, and sincere example of the values he promoted. He was canonized as a saint in 1174 and declared a Doctor of the Church in 1830. Bernard was born at Fontaines, near Dijon, in France, into the noble class. His father, Tescelin, was a knight of the lower nobility, and his mother, Aleth, was a daughter of the noble house of Montbard. She was a woman distinguished for her piety, but died while Bernard was still a boy. Constitutionally unfit for the military of his father, his own disposition as well as his mother's early influence directed him toward a career in the church. Bernard's desire to enter a monastery, however, was opposed by his relatives, who sent him against his will to study at Châtillon-sur-Seine in order to qualify him for high ecclesiastical office. Bernard's resolution to become a monk was not shaken, however. It is a testimony to the nature of his personality that when he finally decided to join the Benedictine community at Citeaux, he took with him his brothers, several of his relations and a number of friends. Bernard exorcising a possessed person, c. 1500. The keynote of Cistercian life was a literal observance of the Rule of Saint Benedict, rejecting pompous ecclesiastical trappings that characterized some Benedictine monasteries and the Church generally during this period. The most striking feature in the Cistercian reform was the return to manual labor, especially field-work. After Bernard's arrival with his 30 companions in 1114, the small community at Cîteaux grew so rapidly that it was soon able to send out offshoots. One of these, Clairvaux, was founded in 1115, in a wild valley of a tributary of the AubeRiver, on land given by Count Hugh of Troyes. There Bernard was appointed abbot, a remarkable rise for such a recent initiate. Though nominally subject to Cîteaux, Clairvaux soon became the most important Cistercian house, owing to the fame and influence of Bernard. Despite an avowed intention to devote himself strictly to monastic concerns, Bernard soon involved himself in the affairs of the outside world. By 1124, when Pope Honorius II was elected, Bernard was already reckoned among the greatest of French churchmen. He now shared in the most important ecclesiastical discussions, and papal legates sought his counsel. "A Templar Knight is truly a fearless knight, and secure on every side, for his soul is protected by the armor of faith, just as his body is protected by the armor of steel. He is thus doubly-armed, and need fear neither demons nor men." Thus in 1129 he was invited by Cardinal Matthew of Albano to the Council of Troyes. An enthusiastic supporter of the spirit of the Crusades, Bernard was instrumental at Troyes in obtaining official recognition of the Knights Templar—active as a military force with religious roots since the end of the First Crusade—as an authorized religious order. In the following year, at the synod of Châlons-sur-Marne, he ended the crisis arising out of certain charges brought against Henry, Bishop of Verdun, by persuading the bishop to resign. Bernard’s significance reached its zenith after the death of Pope Honorius (1130) and the disputed election that followed, in which Bernard became the champion of Innocent II. A group of eight influential cardinals, seeking to stave off the influence of powerful Roman families, quickly elected Bernard's former pupil, Cardinal Gregory Papareschi, a proponent of the Cistercian reforms, as Innocent II. Their act, however, was not in accordance in Canon Law. In a formal conclave, Cardinal Pietro Pierleoni was elected by a narrow margin as Pope Anacletus II. Pope Innocent II, Bernard's former pupil. Innocent, denounced in Rome as an "anti-Pope" was forced to flee north. 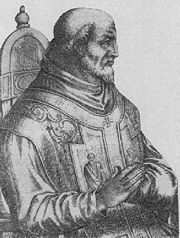 In a synod convoked by Louis the Fat at Etampes in April 1130, Bernard successfully asserted Innocent's claims against those of Anacletus and became Innocent's most influential supporter. He threw himself into the contest with characteristic ardor. Although Rome supported Anacletus, France, England, Spain and Germany declared for Innocent. Innocent traveled from place to place, with the powerful abbot of Clairvaux at his side. He even stayed at Clairvaux itself, a humble abode so far as its buildings were concerned, but having a strong reputation for piety, in contrast to Rome's fame for pomp and corruption. Bernard accompanied Innocent to parley with Lothair II, the Holy Roman Emperor, who would become a key political supporter of Innocent's cause. In 1133, the year of the emperor's first expedition to Rome, Bernard was in Italy persuading the Genoese to make peace with Pisa, since Innocent had need of both. Anacletus now found himself in a far less advantageous position. In addition, although he had been a well respected cardinal, the fact of his Jewish descent now scandalized some quarters and the "anti-pope" label now stuck to him as readily as Innocent. The emboldened Innocent now traveled to Rome, where Bernard, never one to compromise, shrewdly resisted an attempt reopen negotiations with Anacletus. The papal residence at the Castel Sant'Angelo, however, was held by Anacletus, and he was supported by the Norman King Roger II of Sicily. He was thus too strong to be subdued by force, for Lothair, though crowned by Innocent in Saint Peter's, was distracted militarily by a quarrel with the house of Hohenstaufen in his home area. Again Bernard came to the rescue. In the spring of 1135 he traveled to Bamberg where successfully persuaded Frederick Hohenstaufen to submit to the emperor. In June, Bernard was back in Italy, taking a leading part in the pro-Innocent Council of Pisa, which excommunicated Anacletus. In northern Italy, Bernard then persuaded the Lombard rulers of Milan, normally key opponents of imperial claims, to submit to Lothair and Innocent. The Milanese leaders even reportedly attempted to coerce Bernard against his will into becoming bishop of Milan, which he refused to do. When Anacletus finally died on January 25, 1138, Cardinal Gregorio Conti was elected his successor, assuming the name of Victor IV. Bernard's crowning achievement in the long contest was the abdication of the new “antipope,” the result of Bernard's personal influence. The schism of the Church was healed and the abbot of Clairvaux was free to return in triumph to his monastery. 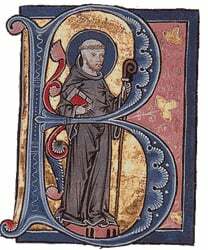 One result of Bernard's fame was the growth of the Cistercian order. Between 1130 and 1145, no less than 93 monasteries in connection with Clairvaux were either founded or affiliated from other rules, three being established in England and one in Ireland. In 1145, another Cistercian monk, once a member of the community of Clairvaux himself, was elected as Pope Eugenius III, succeeding Innocent II. This was a triumph for the order, as well as for Bernard, who complained that all who had suits to press at Rome applied to him, as though he himself had become pope. 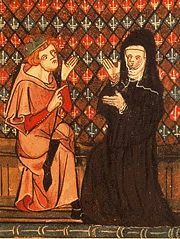 Abelard and and his famous lover Heloise, who herself later become a famous abbess who corresponded with Bernard. Clairvaux itself had meanwhile (1135–1136) been transformed outwardly—notwithstanding the reported reluctance of Bernard—into a more suitable seat for an influence that overshadowed that of Rome itself. Despite an outward posture of humility, Bernard was soon once again passionately involved in a major controversy, this time not over Church politics, but theology. His nemesis this time was the greatest intellect of the age, Peter Abelard. Bernard had opposed Abelard since 1121, when he and others had succeeded in forcing the brilliant scholar from his post at the University of Paris. 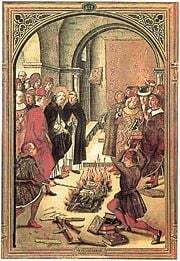 Considering the rationalistic attitude typified by Abelard to represent a serious threat to the spiritual foundations of Christendom, Bernard now renewed his accusation of heresy against the scholar and became the prosecutor in his trial. He brought a total of 14 charges against Abelard, concerning the nature of the Trinity and God's mercy. When, however, Bernard had opened the case at Sens in 1141, Abelard appealed to Rome. Bernard nevertheless succeeded in getting a condemnation passed at the council. He did not rest a moment until a second condemnation was procured at Rome in the following year. Abelard, meanwhile, had collapsed at the abbey of Cluny on his way to defend himself at Rome. He lingered there only a few months before dying. How the age's most gifted spiritual leader might have fared in a direct confrontation with the age's greatest intellect therefore remains a question of discussion. Saint Dominic vs. the Cathars. Bernard also became a major force in the battle against the more obvious heretics of southern France. Languedoc especially had become a hotbed of heresy and at this time the preaching of Henry of Lausanne was drawing thousands from the orthodox faith. Henry rejected the doctrinal and disciplinary authority of the Roman Church, accepted the Gospel as the primary rule of faith, and considered both infant baptism and some other Catholic sacraments to be invalid. In June 1145, at the invitation of Cardinal Alberic of Ostia, Bernard traveled in the south. Bernard's preaching and reputation for piety reportedly swayed many to return to orthodoxy, and Henry himself refused to publicly debate the great Abbott, perhaps fearing arrest. Henry was indeed imprisoned after Bernard returned to his abbey, although the Henrican heresy itself is known to have persisted. In southern France, Bernard was also active against the heresy of the Cathars and Waldensians. His preaching, aided by his reputation and ascetic appearance, was an effective tool for the Catholic cause at least temporarily, since it provided evidence that the heretics did not possess a monopoly on missionary work and humility. 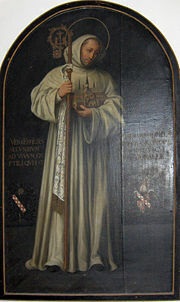 Ironically, however, it would be the work of the Dominican disciples of Bernard's intellectual enemies, the scholastics, who most effectively worked to counter the theological arguments of the Cathars, while a later ascetic, Saint Francis of Assisi, would emerge as a powerful example of authentic orthodox spirituality in the later twelfth century. Bernard traveled through northern France mobilizing crusaders with promises of spiritual rewards. He also preached in Flanders and the Rhine provinces. One reason for his extended preaching tour into Germany was the rabble-rousing of an itinerant monk, Radulf, who had stirred the German populace to violent anti-Semitic attacks. Bernard persuaded the populace not to murder the Jews of Europe on their way to the Holy Land, for which he is remembered as a truly "righteous Gentile" by the Jews of the Rhineland. However, his argument for refraining from anti-Jewish violence was not love for the Jews; it was that they must be allowed to exist as a testimony to the misfortune that falls on those who oppose Christ. 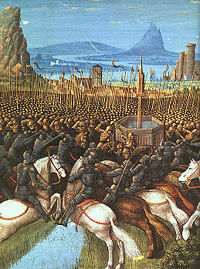 The Knights Templar, shown here in battle during the Crusades, honored Bernard as their patron. At Speyer on Christmas Day he also succeeded in persuading Conrad, king of the Romans, to join the crusade. Bernard's successes in promising God's protection of the crusaders, however, proved to be anything but prophetic. The news of the defeats of the crusading host first reached Bernard at Clairvaux, where Pope Eugene III, driven from Rome by the revolution of Arnold of Brescia, was his guest. Bernard, in March and April 1148, had accompanied the Pope to the Council of Reims, where Bernard led the attack on certain propositions of the scholastic theologian Gilbert de la Porrée. Bernard's influence, previously a decisive threat to those whom he challenged on theological grounds, had little effect on this occasion. The disastrous outcome of the Crusade was a blow to Bernard, who found it difficult to understand why God would move in this way. Declining to believe that he and the Pope could have been wrong to involve Christendom in the first place, he ascribed the Crusade's failure to the sins of the crusaders and other Christians themselves (Episte 288; de Consideratione. ii. I). On the news of the disaster that had overtaken the crusaders, an effort was made to salvage the effort by organizing another expedition. At the invitation of Suger, abbot of St. Denis, now the virtual ruler of France, Bernard attended a meeting at Chartres in 1150 convened for this purpose. Here, he himself, on the basis of his previous leadership, was elected to conduct the new crusade. Eugenius III, however, held back from fully endorsing this project, and Bernard eventually wrote to the Pope claiming that he never intended to lead such a crusade. Bernard was aging, exhausted by his austerities, and saddened by the failure of the Second Crusade as well as by loss of several of his early friends. His zeal to involve himself in the great affairs of the Church, however remained undimmed. His last work, the De Consideratione, written to Eugene III and describing the nature of papal power, shows no sign of failing power. 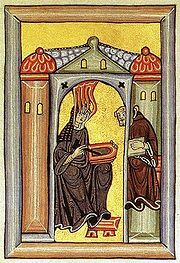 Bernard also had a powerful effect on the three greatest women of the age: Hildegard of Bingen, Eleanor of Aquitaine, and Heloise, the former lover of Abelard. To Hildegard, he was a protector. She wrote to him seeking his opinion about her mystical experiences. He encouraged her and promoted her writings, even with his fellow Cistercian, Eugenius III. In this male-dominated age when women were rarely literate and female visionaries were more likely to be treated as heretics than authentic prophetesses, it is unlikely that her works would have been preserved without his support. Heloise's mentor and former lover, Abelard, had become the victim of Bernard, who denounced him as a heretic. 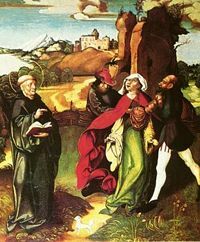 Bernard, however, approved of Heloise's capable management as the abbess of several monasteries for women and maintained cordial relations with her in that capacity. Ironically, it had been Abelard himself who helped Heloise develop her Rule for female monastics, and Heloise would in turn preserve for posterity some of her mentor's teachings, which would otherwise be lost to history as a result of Bernard's success in having Abelard's writings burned. Eleanor of Aquitaine, the greatest woman of her age, crossed paths with Bernard twice during her early career with her first husband, Louis VII. Previously Bernard had criticized Eleanor's ostentation and lack of modesty. At their first meeting in 1144, Bernard bested her, as she broke down under the great monk's scolding and agreed to mend her arrogant ways. Bernard is credited with promising her a child as a blessing for her repentance, and a daughter was indeed forthcoming. On the second occasion, the two worked together to orchestrate the drama of Bernard's preaching of the Second Crusade, with Louis and Eleanor taking the cross in response. The marriage of Louis and Eleanor, however, would eventually come to an end and she would go on to become the wife of Henry II of England and the mother of two English kings: Richard I and John. Lactatio of Bernard of Clairvaux (the milk wonder) from MS Douce 264, f.38v. in the Bodleian Library, Oxford. Bernard expanded upon Anselm of Canterbury's role in transmuting the sacramental ritualness in Christianity of the Early Middle Ages into a new, more personally held faith, with the life of Christ as a model and a new emphasis on the Virgin Mary. His sense of immediate, personal connection with God is evident throughout the large corpus of writing that he left, from his letters and formal treatises on theology, to his mystical contemplations on the monastic life, his many hymns, and his sermons on such topics as the Song of Solomon. Not a brilliant intellect, but a powerful exponent of humble faith, for Bernard, theology was not about the abstract search for truth. It was about expressing in intellectual terms the simple spiritual path of devotion by which the soul finds loving communion with God. Bernard of Clairvaux, by Georg Andreas Wasshuber (1650-1732), from a statue in Clairvaux believed to be an accurate likeness. The greatness of Bernard is generally regarded as being his character. The world’s riches had no meaning for Bernard, as the world itself was merely a place of temporary banishment and trial, in which men are but "strangers and pilgrims" (Serm. i., Epiph. n. I; Serm. vii., Lent. n. I). For him, the truth was already known and the way of grace was clear. He thus had no sympathy with the dialectics of scholastic teachers, who he generally considered to be leading people astray from grace. With merciless logic, he followed the principles of the Christian faith as he conceived it. As for heretics, he preferred that they should be vanquished “not by force of arms, but by force of argument." However, if a heretic refused to see the error of his ways, Bernard considered that "he should be driven away, or even a restraint put upon his liberty" (Serm. lxiv). Although he opposed mob violence, he added that, "it would without doubt be better that they (heretics) should be coerced by the sword than that they should be allowed to draw away many other persons into their error." (Serm. lxvi. on Canticles ii. 15). Bernard at his best displays a nobility of nature, a wise charity and tenderness in his dealings with others, and a genuine humility, making him one of the most complete exponents of the Christian life. At his worst he typifies the intolerance and obscurantism of his age both toward the logic of the rationalists and the alternative pietism of the heretics. Bernard's works have been reprinted in many editions and he remains popular among both Protestants and Catholics. In The Divine Comedy, Bernard is the last of Dante's spiritual guides and offers a prayer to the Virgin Mary to grant Dante the vision of the true nature of God, a vision which is the climax of the poet's masterpiece. "Bernard," wrote the sixteenth century Catholic humanist Erasmus of Rotterdam in his Art of Preaching, "is an eloquent preacher, much more by nature than by art; he is full of charm and vivacity and knows how to reach and move the affections." Bernard of Clairvaux was indeed the greatest preacher of his age, and also its most dominant personality. Letters: of these more than 500 have been preserved, of great interest and value for the history of the period and as an insight into his character. dogmatic and polemical: De gratia et libero arbitrio, written about 1127, De baptismo aliisque quaestionibus ad mag. Ilugonem de S. Victore, Contra quaedam capitala errorum Abaelardi ad Innocentem II (in justification of the action of the synod of Sens against Abelard). ascetic and mystical: De gradibus humilitatis ci superbiae, his first work, written perhaps about 1121; De diligendo Deo (about 1126); De conversione ad clericos, an address to candidates for the priesthood; De Consideratione, Bernard's last work, written about 1148 at the Pope's request. monastic: Apologia ad Guilelmum, (c. 1127); De laude novae militiae ad milites templi (c. 1132—1136); De precepto et dispensatione, (some time before 1143). on ecclesiastical government: De moribus et officio episcoporum,, (1126) for Henry, bishop of Sens; the De Consideratione mentioned above. a biography, De vita et rebus gestis S. Maiachiae, Hiberniae episcopi, written at the request of the Irish abbot Congan and an important source of the ecclesiastical history of Ireland in the twelth century. hymns: Many hymns ascribed to Bernard survive, e.g., Jesu dulcis memoria, Jesus rex admirabilis, Jesu decus angelicum, Salve Caput cruentatum. ↑ Louis and Eleanor had certainly decided to take the cross prior to hearing Bernard preach. Nevertheless, their formally responding to his call had a tremendous effect. Opera omnia Sancti Bernardi Claraevallensis The Complete Works of St. Bernard of Clairvaux. (in Latin). St. Bernard of Clairvaux. New Advent. French translation with notes of the complete works of Bernard of Clairvaux: (Saint) Bernard de Clairvaux Institut des Sources Chrétiennes. Saint Bernard and the Cistercians plus Abbey Photos. Adrian Fletcher’s Paradoxplace. Saint Bernard of Clairvaux A slightly less adulatory assessment. 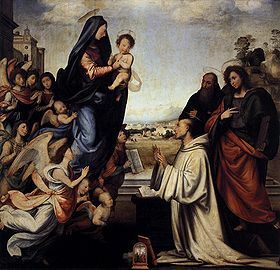 History of "Bernard of Clairvaux"
This page was last modified on 15 December 2016, at 16:11.